We heard about Walk91 on the internet by Google search. The planned itinerary was excellent. We were very happy with all the accommodation and our hosts were wonderful. 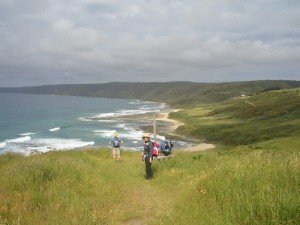 The Great Ocean Walk was fabulous! However… creating a track through from Johanna beach to Melanesia beach would be an improvement, therefore cutting out the walk inland and up into the farmland area. Our only tip would be to ensure that you are fit enough to meet the schedules. We were very happy with everything. I have given details to Ailsa Piper, who wrote “Sinning across Spain”, the story of her walk from Grenada to Santiago de Compostela in Spain. I think she will walk it sometime soon. Thanks again for providing us with such a memorable trip!